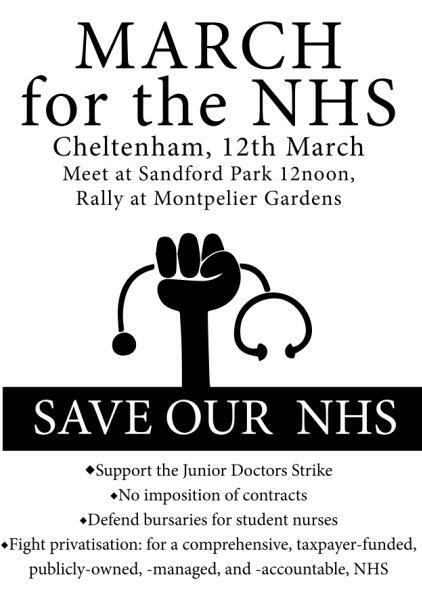 Recently, doctors who work in NHS hospitals have taken strike action against a new contract of employment that threatens patient safety (they will strike again on 9-11th March, and on the 6th-8th and 26-28th April). In the ballot of more than 37,000 junior doctors in England, 98% voted in favour of strike action – such is the level of opposition. Opinion polls suggest around two-thirds of the public support the strike action. Despite this, the government still refuses to listen to doctors, and Jeremy Hunt now says he won’t even negotiate. If the government defeats doctors, other health workers will be next. Already local district nurses have had their hours, terms and conditions changed – pushing many to leave the NHS. Cheltenham A&E has been downgraded, and the Minor Injuries Unit at Stroud is regularly closed overnight. The NHS is under pressure as it is chipped apart, privatised and care is underfunded. The government is also planning to remove bursaries that enable people to afford to train to be nurses. The government’s attacks are undermining our public services – the future of the NHS is at stake.